Thank you!!! I'd stopped looking at Pinterest (which I also love) because of this issue. I was having serious withdrawals but every time I looked I got too frustrated. My page now looks like a very sparse spiders web after a brutal storm but I LOVE it! any idea as to what browser add on you could use while in safari? Lorie, I use this fix in Safari, it works fine. I have two different links on my bookmark bar... "Remove picked for you" and "I hate my friends" and they both work great. What a public service it is to make this script available free! We've done the same thing with Pin4Ever, too. After installing the toolbar, you just click the "Clean Home Feed" button when you want to see the Pinterest page without Picked For You and Promoted Pins. We've taken out the gaps where the removed pins were, too, in case you prefer the traditional Pinterest look, or don't want to scroll as much, or this version isn't working for you. And Pin4Ever comes with other freebies, too - a full back up of all your pins and boards, and Pin Anything to capture screenshots when the Pin It button doesn't work. Thanks for this. Awesome. But suddenly there are no items in my feed at all. Once the tool removes all the Picked For You pins, there is nothing left. Pinterest is dying because of this change. Cited this post today on my blog. You are a godsend! Thanks so much. does 'remove picked for you' still work for anyone? when i try to drag the link to my bookmarks it is just greyed out (i can drag 'i hate my friends fine though). i need to block those promoted pins, someone help!! Beth~My home page is so cluttered with "Picked for you" and "Promoted by" pins that I can't even *Find* my friends pins anymore! So I was happy to find your info! I installed Greasemonkey on my PC. I copied your script with my Edit button. Is there a different way to copy it to the clipboard? Because when I clicked on the monkey icon, "New User Script" did not open. But in the upper left over the tool bar, "Remove Picked For You" popped up. Weird. I clicked on that but, of course, none of the offending pins got removed from my home page. What am I doing wrong? Help! thank you! those "picked for you" pins are driving me crazy!! Both the Greasemonkey and the Tampermonkey script are working! It was really sad to see how much of my feed had been consumed with "promoted" and "picked for you pins". I get that they need to make money, but honestly what is the point of curration if they (Pinterest) think an algorithm can pull together pins for me better than I can for myself? Is there any way to do the same thing when using the app on an iPad? Greasemonkey worked wonderfully! Now I can keep using Pinterest to see what I WANT to see. Thanks so much!!! Run script in Chrome + Tampermonkey and seems to be working fine so far. Much appreciated! Thank you for this! I used it with TamperMonkey for Chrome and it works like a charm. (Honestly, I love Disney, but that doesn't mean I want 2 dozen pictures of Mickey Mouse on my Pinterest page. I know what he looks like.) I'm also adding you to my reader because I need more smart blogs in my life. I'm so much happier now. At first I thought it didn't work because the whole page was blank.... but that was just because there were so many "picked for you" pins to block out. Thanks for sharing this with us! Thank You! When I used the Remove PfY link, entire pages of my home thread went blank because I've been so overrun with PfY garbage. I was hiding each one, but removing them in one click with this function is much more satisfying! Thank you for this, but now I have another problem. After removing my picked for you pins there is nothing left! Literally, nothing! I don't follow anyone, I just like to look at random stuff and click on what is interesting to me. Now I literally see the exact same pins every time I open up my home page. Looks like it is repeats or nothing. I will not take the time to delete every single pin. Hate to say it, but it looks like my love affair with pinterest is over. I don't understand your instructions at all! I'd be happy to explain anything! What part are you stuck on? This worked wonderfully for me until a Java update last week. Now it's not working at all. Have you heard others say this? I've updated the bookmark to fix the problems - if you delete your existing bookmark and add the new one from the blog post, this should fix it. Thanks Beth for doing this! I appreciate it very much. I'm a Pinterest addict and it had gotten since that Java update that I rarely saw anything I was interested in. This is such a big help. Interesting though that I now have no promoted by pins except 1 in the top right corner when I sign in. The bookmarklet doesn't remove that 1. Very strange. But that's ok with me...........it gets all those picked for you's and that's a whole bunch! I'd love to get some kind of mobile solution working, but haven't had much luck so far. I love this script, but it recently stopped working for me in Safari! It will remove only one "Picked for you" pin per page and leave the other visible ones around it shown (before it would remove all visible "picked for you" pins). If I click the bookmark again, nothing happens. Any idea what's going on? The script isn't working anymore (on Chrome at least). Can you try to update the script? Your "remove picked for you pins" bookmark isn't working anymore. :( I've used it for a year+ but today it stopped working. It's a shame because your bookmark was the only thing keeping pinterest tolerable. My "Remove Picked for You" link in Safari has suddenly stopped working! Nothing, nada! I tried reinstalling it, but still nothing. Could Pinterest have wised up to you and blocked it somehow? Thank you! It's not removing the "promoted by" ads, but there's a whole lot less of them than the other stuff. I noticed today that the remove picked for you function stopped working. Is this an issue with my Chrome or has Pinterest changed something? Thanks! Sad to say but I think Pinterest are on to you. 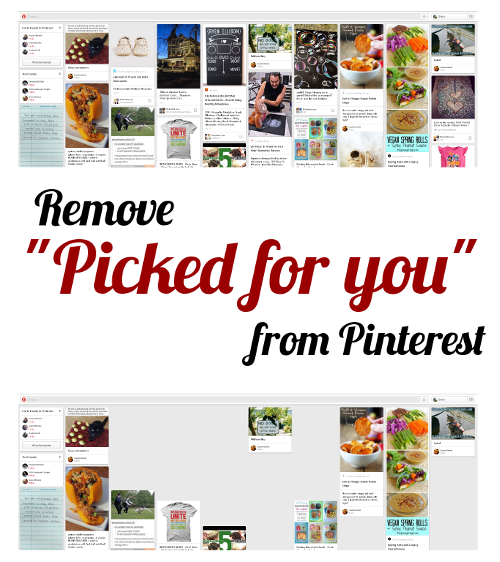 Today I loaded up Pinterest, clicked on my "remove" button and nothing happened :( all my picked for you pins are still there. would it be possible to have an updated version of "remove picked for you" link? I have used it ever since I discovered it, but it's not working now. I also would like to thank you for sharing this. Thanks to you I have been able to enjoy Pinterest! I've used your Remove Picked for You bookmark for a long time now, and all of a sudden it won't work! Pinterest must have gotten wise to it. Is there a fix? Beth, the bookmark for Remove Picked For You does not work any more? It used to work like a charm. Any idea why? oh nooooo!! The bookmark has stopped working?!?! In just the past week it's stopped for every computer I have :( I tried re-do'ing it and refreshing everything and still it doesn't work. Any advice? I LOVE this thing! Thank you so much for the fix!! I LOVED the 'Remove Picked For You' but it stopped working. I use Safari. I just deleted the previous link and dragged the link over again but it doesn't work any longer. I suppose Pinterest has learned a way around it? thanx so much for the fix , you really are devoted .